For me, season 7 was my favorite season (of Archer) so far. I love the direction they took the series in and while it sets up what could be an incredibly creative season 8….Season 7 was just a ton fun! 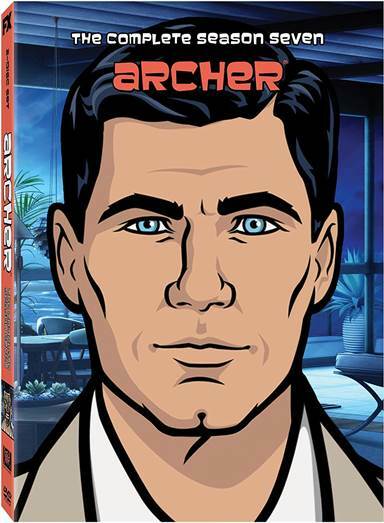 With the eighth season of Archer kicking off a couple of weeks ago on FX, 20th Century Fox has released the seventh season of the show on DVD. If you haven't caught up on Archer Season 7 as of yet, there are a few new things this season. Season 7 starts with Archer and gang moving to L.A and opening a Private Investigators office. Of course, the inspiration is highly visible…many references to Magnum P.I. and Charlie's Angels are all over the place. In fact, Archer even gets Magnum's car and every transition from scene to scene consists of the Charlie's Angel's silhouette seaways. This season definitely has a slightly different feel to it. A big plus is the addition of composer J.G. Thirlwell who sets the tone for the season. This is the first season where there was a score beyond the opening and closing music. It's a great addition giving the series a great film noir feel. One of my favorite parts of this season was the opening of the first season. Spoofing Sunset boulevard, Archer's body is found face down floating in a pool leaving one to believe the end of this season has a definitive ending. Shift back 6 months previous and in walks Veronica Deane, a famous older actress, who had a disc with some "sensitive material" stolen from her possession. She offers "The Figgins Agency" $100,000 to get the material back. Of course, Archer jumps at the chance. They head to Alan Shapiro's house (the Lawyer they were told had the disc) to get the disc back. Now if you know Archer, somehow something is going to get messed up and after retrieving the disc and handing it off to Veronica Deane…..the real Veronica Deane walks in the office wanting to hire "The Figgins Agency" to recover a disc with "sensitive material" that was stolen from her lawyer's residence. Whoops! Of course, what I find the most fun is the guest voice actors who randomly appear on the show. The biggest addition is Patton Oswalt, who plays the lawyer Alan Shapiro appearing in 6 of the 10 episodes of season 7. Also, making vocal cameos is J.K. Simmons, Keegan-Michael Key, Jon Daly, Jon Glaser, John O'Hurley and of course a season wouldn't be complete without a visit from Christian Slater playing just "Slater". For me, season 7 was my favorite season so far. I love the direction they took the series in and while it sets up what could be an incredibly creative season 8….Season 7 was just a ton fun! I guess I'm a sucker for a flashback to the Private Investigator shows of the 70's with the vulgarity of Archer's Gang! I give Archer Season Seven 3.75 stars out of 4 (Grade B+), it's fun, entertaining and a must have for Archer fans! Download The Complete Seventh Season from the iTunes Store in Digial HD.